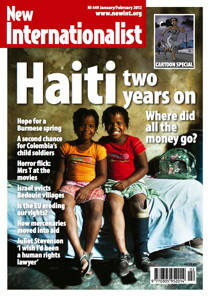 The earthquake that struck Haiti in January 2010 was a humanitarian disaster of unimaginable proportions. The world’s initial response to Haiti seemed encouraging, with governments, NGOs and individuals pledging to do whatever they could to help, and relief workers flooding into the country. However, their efforts were not free from controversy, and two years on Haiti’s plight continues, despite having faded into the background of the world’s news coverage. In the first of two podcasts discussing Haiti’s reconstruction, our podcast editor Nyan Storey spoke about the positive and negative aspects of NGO relief work in Haiti with Mark Schuller, who is a leading anthropologist working in Haiti, an expert on the relief effort, and co-editor of Tectonic Shifts: Haiti since the Earthquake. To find out more about Haiti after the earthquake, see our January issue, which features a six-page graphic novella by Haitian artists, along with in-depth articles examining the country's past, present and future. Have the public had enough of manipulative charity marketing? NGOs are seen as cash-obsessed with advertising campaigns portraying beneficiaries as hapless victims, says Natalie Nezhati.